After a successful international touring and performance career in 1994 Calvin took up residence on Saltspring Island and began teaching fiddle. There he founded the Saltspring Fiddlers before moving to Victoria in 1996. From 1996 to 2007 he taught folk fiddling at the Victoria Conservatory of Music where he established the Conservatory Fiddlers Orchestra, an ensemble of over sixty fiddlers ages six to eighty-six. Since 2004, Calvin has taught with the Kole Crook Fiddle Association in remote First Nations communities of the Northwest Territories. He continues to travel and teach regularly in these northern communities. In 2011 Calvin was invited to teach in the First Nations communities of the Chilcotin – Caribou district of British Columbia. Since 2011, He has been collaborating with community Health Departments and mental health clinician, Deb Trampleasure to create a suicide preventive fiddling program. This innovative project incorporates the Circle of Courage philosophies of Dr. Martin Brokenleg with the good old toe tapping fiddle tunes that have become part of traditional First Nations culture, leading to a recovery of youth at risk. He has released three recordings of original music that showcase a wide range of stylistic influences including jazz, funk, Brazilian, bluegrass, classical, and more. In his recent project, Matuto, Ross collaborated with many of the most sought after young musicians on the NYC scene. Matuto is Brazilian slang for “country bumpkin.” With this group, Clay mixes the best of bluegrass and baiao for a sound like a Carnaval in the Appalachian Mountains. Clay has also played and recorded with the multi award winning April Verch Band. Daniel Lapp grew up in Prince George, BC in a musical house with deep prairie fiddling roots. His mother, Charlotte, spent much of her childhood accompanying her farming, fiddling father, Daniel Wutzke on piano at old-time Alberta dances and visits from ‘grandpa’ always involved playing ‘tunes’. Grandpa Dan taught Daniel the Black Velvet Waltz on one of these visits on a cherished fiddle that would eventually be passed on to the younger musician. In between these musical visits were many others with fiddling uncles and accordion playing aunts who also had their influence on Daniel’s sister Beverley Eggen who has become an accomplished accordionist with whom Daniel performs regularly. Other early influences were the unusual proportion of great fiddlers that resided in Prince George during the 1960’s and 70’s who were always generous and quick to share their knowledge and love of old-time music with young fiddlers. The ‘teen’ years involved attending summer fiddle contests around Western Canada, often with Grandpa Dan’s coaching on the sidelines and mother Charlotte as driver and accompanist. Over the years there were various BC Championship trophies won and eventually invitations to judge and guest at the contests years later. The musical passion eventually lead to a music profession starting with Daniel leaving Prince George after high school in 1983 and getting his BMus degree on trumpet from the University of Victoria. After more training and getting a kick-start to his career in Toronto and Vancouver, Daniel settled in Victoria in 1989 with his new family and has since become a well-known and respected International performer and teacher as well as a father of four. He has toured across Europe, Australia, China, Israel, the USA and Canada and has performed with many recognizable names such as Spirit of the West, Rickie Lee Jones, Neil Osborne, Gord Downie, Barney Bentall, Jim Byrnes, Jim Cuddy, Elvis Costello, Lou Reed, Stephen Fearing, Ed Robertson and Roy Forbes. He has also played piano for many well-known fiddlers such as Calvin Vollrath, Pierre Schryer, Frankie Rodgers, Jarvis Benoit and Jerry Holland. He started the BC Fiddle Orchestra in 1994 that has inspired dozens of young fiddlers and the Victoria Fiddle Society in 2001 that holds monthly jams with up to 100 participants. 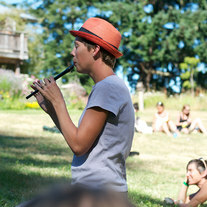 In 2010 Daniel was a featured fiddler in the Opening Ceremonies of the Vancouver Olympics and has recorded many albums of folk, jazz and electronic music. In 2012 Daniel received the Queen’s Diamond Jubilee ‘Service’ Award and in 2013 was the recipient of the Canadian Folk Music Association ‘Innovator’ Award for his contribution to Canada’s fiddle culture. Following a trip to Scotland where Daniel was asked to play tunes from his ‘neck of the woods’ he began collecting original BC Fiddle tunes which now number well over 1000 by over 100 composers, many of which come from the Prince George area where he grew up. Inspired by Grandpa Dan’s ‘house of music’ in 2005 Daniel started a business called the House of Music in Victoria, BC. This had over 20 teachers and 300 students learning many styles of music. His experience running this business lead to his recent appointment as the first Artistic Director of the School of Contemporary Music at the Victoria Conservatory of Music. In this position, Daniel is developing new curriculum and ways of inspiring the community to engage in music for themselves and with each other as well as an innovative Diploma program in Music Performance for fiddlers and all instruments. Two-time Juno-winning banjoist, composer, and instigator Jayme Stone makes music inspired by sounds from around the world, bridging folk, jazz and chamber music. His award-winning albums both defy and honor the banjo’s long role in the world’s music, turning historical connections into compelling music. "The Other Side of the Air" (2013) is a travelogue of imaginary landscapes and faraway lands, traversing the Cinnamon Route through Persia and India. "Room of Wonders" (2010) explores music from Norway, Sweden, Bulgaria, Brazil, Italy and North America. "Africa to Appalachia" (2008) is a boundary-crossing musical collaboration with griot singer Mansa Sissoko that explores the banjo’s African roots and Stone’s adventures in Mali. His latest album—“Jayme Stone’s Lomax Project"—focuses on songs collected by folklorist and field recording pioneer Alan Lomax. This “collaboratory" brings together some of North America’s most distinctive and creative roots musicians to revive, recycle, and reimagine traditional music. Out on Borealis Records, it features Grammy-winning singer Tim O’Brien, Bruce Molsky, Margaret Glaspy, Moira Smiley, Brittany Haas, Julian Lage, and more. Stone is a passionate educator, producer, and collaborator. Known for diversity, innovation and passion, cellist Jeff Faragher is a natural entertainer and has excited audiences across North America and in Europe with his dynamic musical style in classical, folk and jazz genres. Born and raised in Edmonton, Alberta, Jeff started learning music at age 3 with the Kodaly program then shortly after, started cello with Suzuki cello teacher, Diana Nuttal. He then continued his studies in music at the University of Alberta under renowned cellist and teacher, Tanya Prochazka. With a focus on chamber music, Jeff was one of the founding members of the Pretorius String Quartet which received the prestigious Malcolm Forsyth String Quartet Scholarship four years running as they worked through their undergraduate degrees as Edmonton’s foremost performing string quartet. In addition, Jeff spent many summers touring the world and studying with famous cello teachers such as Janos Starker, Aldo Parisot and Yo-Yo Ma. Following his years in Edmonton, Jeff moved to Montreal to pursue a Masters of Music degree studying with Montreal Symphony’s principal cellist, Brian Manker and the Orford String Quartet founding member, Marcel Saint-Cyr. Having finished his degree, Jeff moved back to Edmonton to start his family and his professional career as a cellist, teacher and music director. In his two short years in Edmonton he built a cello studio of over thirty private students, was head cello instructor with the Edmonton Public Schools music enrichment program and was department head of strings at Grant MacEwan College. He also performed regularly with chamber groups, folk groups and symphonies across Alberta. At the University of Alberta Jeff began a Doctor of Music focusing on contemporary styles on the cello. This lead him down the path of using his jazz training to create new styles of playing cello in many different genres including Celtic, gypsy-jazz, middle-eastern, tango, and flamenco. Jeff feels at home in almost any ensemble and brings his energy to the mix. Since moving to Nelson, BC, Jeff has shared his passion and experience with the professional music community and students alike. He is an active performer in both classical and folk music as well as the musical and artistic director of the Symphony of the Kootenays. Whatever he is doing, cellist Jeff Faragher is looking to innovate, perform and inspire his audiences, colleagues and students alike. Born in Toronto, Joe Phillips has carved out a career as one of Canada’s most versatile double bassists. Currently playing with Jayme Stone’s Lomax Project, he has also played and recorded both bass and guitar with the likes of Pierre Schryer, Shane Cook, Nuala Kennedy, Sarah Slean, David Braid, Andrew Downing, Miranda Mulholland, A Fig For A Kiss, Ruth Moody and the Wailin’ Jennys. An accomplished classical musician, Joe has been the principal bassist of Orchestra London Canada, Sinfonia Toronto and the Thunder Bay Symphony, and has performed with the Toronto Symphony, the National Arts Centre Orchestra, Les Violons du Roy and the Kitchener-Waterloo Symphony Orchestra. Joe has had the opportunity to play with some of the best chamber musicians in Canada and the world through his work with the Art of Time Ensemble, Sweetwater Music Festival, Festival of the Sound and the Ottawa Chamber Music Festival. ​Joe lives in London Ontario with his partner Sylvie, and their two children. Karen earned a B.A. in music education from the University of Idaho. She has taught everything from general music and choir to beginning band, middle school orchestra and high school band. Currently, Karen is the string ensemble teacher at the Sandpoint Waldorf School. She also teaches private music lessons, and is a gifted fiddler. She loves the sense of community that comes from shared music and social dance. Karen started the Sandpoint Fiddle & Folk Arts Camp to create a musical community beyond the boundaries of individual schools and towns and to build the confidence of all the musicians who attend through creative performances and group collaborations. Marc Atkinson is one of Canada's finest JUNO-nominated, Western Canadian award-winning musicians. He is the leader and composer of the internationally renowned Marc Atkinson Trio (and co-founder, composer and performer in the acclaimed “The Bills”). The music of this virtuosic group is melodically captivating, sensually charged and ferociously, technically awe-inspiring. Embracing a lifetime of musical influences, Marc and the Trio have just released their fourth CD, The Marc Atkinson Trio IV, praised as the finest yet. The compositions on this CD are punchy, driving and rhythmically inventive. The Trio, formed in 2000, has toured North America, England and Europe and has received standing ovations everywhere they perform from the Montreal Jazz Festival to the Vancouver International Folk Festival to DjangoFest Northwest. Marc Atkinson, a multi-instrumentalist/composer/arranger/producer, is one of Canada's most talented musicians. His catchy compositions, found on the self-titled CDs I, II, III and now IV take guitar beyond the usual repertoire and sound. The tunes have a fiery but elegant guitar style, infused with a catchy blend of influences. All this while still maintaining the laidback humour and casual 'good time feel' of Canada's West Coast. Atkinson's picking has been described as flawless, surprise-filled, sizzling and supremely melodic. His music is original, complex and challenging in its conception and delivery but remains accessible and absorbing. “A force in the world!” says Grammy nominated fiddler, Liz Carroll. Among his many awards, Mark Sullivan is a 3-time Canadian Grand Masters Fiddle Champion and is widely regarded as one of the finest fiddlers in North America today. He is in dmand as a spirited performer and continues to collaborate with many of the finest names in traditional music today. Mark holds his Masters in the Science of Education and is a regular instructor at Music Camps throughout the country. His recent recording, The Gathering Room, is a compilation of original music which showcases his unique Canadian Fiddle style. Canadian fiddle icon Calvin Vollrath says “He is a true master at his craft.” Mark grew up playing for square dances and learning his craft from dance fiddlers. His appreciation for the old time style is evident on his recording, Wednesday Night Clubs, which pays tribute to the local fiddle clubs that continue to play such an important role in sustaining the Canadian Fiddle Tradition. Originally from Bowmanville Ontario, Mark now calls Vancouver BC his home. Ryan is a percussionist with a long history of musical collaborations starting at the University of Idaho where he earned a B.A. in music composition in 1997. He then attended the University of New Hampshire where he completed his Masters in Composition in 1999. Ryan taught private lessons and music classes in private schools in Seattle for a few years before completing his teaching certificate. He is currently the band director at Sandpoint Middle School and Clark Fork Jr/Sr High School. He has played in rock bands, country bands, swing bands, Irish groups, blues groups, jazz quartets and orchestras. At fiddle camp Ryan teaches a combination of performance art and percussion, much like STOMP and the Blue Man Group. He composes pieces for each individual group of students he works with. After first hearing traditional fiddle music in her early teens, Sumaia Jackson began to seek out an Irish and Scottish fiddle community in her hometown of Santa Cruz, CA. A few years into her study, she discovered other roots music traditions such as Appalachian Old Time, Bluegrass, and more recently, Jazz. At age 20, she arrived at Berklee College of Music in Boston, where she continues to immerse herself in the rich traditions of American folk music. During her time at Berklee, she has had the privilege of studying with renowned fiddlers Bruce Molsky, Darol Anger, Casey Driessen, and more, as well as innovative jazz violinists, Jason Anick and Rob Thomas. As a fiddle player, Sumaia will always be caught exploring the convergence of many styles that breed modern fiddling. With command of her tone and elegance in melody, Sumaia’s fiddle playing is both smooth and driving. Tracy Harrison is a Multimedia Artist, Arts Educator and Registered Art Therapist. She has been facilitating art camps, classes and experiences high on the FUN FACTOR for children, teens and adults for over 30 years. ​In the past Fiddle Camp students have created funky fish, pipe cleaner pets, paper lanterns, clay fiddles and drums, etc. This year there will be an emphasis on Parade Paraphernalia! 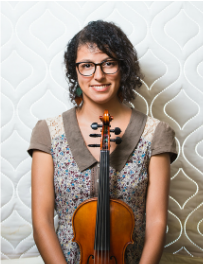 Zavallennahh is an innovative, spunky fiddler/violist, pianist, composer, and community builder. She creates exceptionally evocative original acoustic music, and loves to share her music through teaching and performing. As a recording artist with Dog My Cat records, RT's debut album “Reach” and the duo album “Spark” (under previous name Jaime RT) have both received Canadian Folk Music Award and Western Canadian Music Award Nominations, great reviews, and are favourites of CBC Radio, including the theme song on "North by Northwest: Between the Covers". Zav has toured internationally playing fiddola and keys with Canadian folk legend James Keelaghan and with her talented brother, Daniel Huscroft. She has shared the stage with Liz Carrol, Martin Hayes, Alasdair Fraser, Oliver Schroer, Daniel Lapp, Pierre Schryer, Colin Adjun, Catriona MacDonald, Jerry Holland, and Yves Lambert. Her original writing is winning international composing accolades, and her music has been featured on CBC's Vinyl Cafe and radio stations around the globe. Zavallennahh is passionate and fun. Miss Huscroft is not only a dynamic performer but also loves to share her musical passion with kids, through teaching and school shows. She is often found trekking with her fiddle, teaching in the Northwest Territories, or enthusiastically working her magic at fiddle camps. She is the founder of Fiddleworks Community Development Society, dedicated to sharing the joy of music, building life skills and developing community through innovative fiddle education and music camps. Zavallennahh holds a Bachelor of Music in Piano and Composition from the University of Victoria, is a published author (Fiddleworks Series, Frederick Harris Music) and loves to compose and perform music for classical ensembles as a violist. She is a mother of two young ones above all other callings in her life, and lives with a deep commitment to the earth and community.